They comprise the most successful and shocking tales of terror in cinema history. Now, for the first time, the first eight classic Friday The 13th movies are available together in this killer DVD collection. Beginning with the picture critics have called the original slasher flick, this collection spans nine years and includes seven additional blood-soaked, suspense-filled sagas starring one of the most horrifying characters ever to wear a hockey mask and wield a machete: Jason Voorhees. It's a splatterfest of fan favorites that follow the unstoppable Jason as he cuts and hacks a swath of fear all the way from Crystal Lake to the mean streets of Manhattan. In addition, the collection includes a special disc filled with never-before-seen footage and fabulous extras that will slay even the most jaded horror film aficionado! In 1980, a significant addition to the horror genre came with the surprise hit Friday the 13th. On the surface, it sounded like a rip-off of Halloween, with another mysterious killer and a tale tied to a notable date. However, it’s not fair to brand Friday the 13th as nothing more than a flick that steals from Halloween, for it manages to take from many other horror movies as well. Friday opens with a prologue set at Camp Crystal Lake in 1958. After a sing-along, a pair of teen campers goes off for some lovin’. An unnamed person comes upon them and slaughters the kids. The movie then jumps to Friday, June 13 in the “present day” for the reopening of the site, commonly referred to as “Camp Blood” by the locals. We meet young cook Annie (Robbi Morgan) as she meanders into town. Trucker Enos (Rex Everhart) gives her a lift to the camp but warns her of its curse and tells her to quit. She dismisses Enos as a superstitious kook and goes on her merry way. From there we meet owner Steve Christy (Peter Brouwer) and the rest of the staff as they get the old place into shape. They wonder about Annie, who never makes it. When she hitches another ride, the driver eventually slits her throat. While Steve goes into town, the kids have fun and set up things. They encounter some minor scares and also run into Ralph the local nutbag (Walt Gorney) who warns them of their imminent doom. Like Annie before them, they pooh-pooh this crazy talk and go about their business. Slowly his predictions turn true, however, as someone methodically offs the counselors. Eventually the survivors figure out that something’s wrong and try to fight this unseen evil. One probably shouldn’t criticize Friday for its clichés, since it was one of the flicks that helped turn the concepts into clichés. That said, I couldn’t help but wish the filmmakers had tried just a little harder to add some distinctiveness to the movie. Can a film as derivative as Friday be seen as seminal? Yeah, I think so. The movie doesn’t present much that one could call original, but that packaging made it a little different, and it certainly inspired many copycats of its own. I seriously doubt that the rash of slasher flicks in the Eighties would have existed without the success of Friday. Its lasting legacy may not have anything to do with the content on screen; it may come more from the fact that Friday reached a wider audience than the usual ultra-violent fare. Of course, the series added the character of Jason Voorhees to the public lexicon, but one can’t credit the original flick with that. It introduces the character in a way that doesn’t even remotely resemble the monster of the subsequent entries. I won’t get into the details more fully so I can avoid spoilers, but suffice it to say that Jason is a non-entity in this film. As I watch it now, I find it tough to figure out why Friday became such a sensation. There’s really not much to the movie. It presents extremely generic characters who don’t even aspire to be stereotypes. We know Alice will make it to the end because she’s the plain one, ala Jamie Lee Curtis in Halloween. Subsequent Fridays don’t exactly go nuts with rich, full characters, but the ones in the first movie nonetheless come across as absurdly thin. If you can remember any of their names an hour after the story ends, you’ve either got photographic memory or you’ve seen the flick 100 times. The ridiculously amateurish acting doesn’t help matters. Part of the film’s claim to fame may have come from its graphic nature. While subsequent Fridays would up the violent ante, this one provides material that seemed nastier than expected given the era. It also sets up the basic motif in which the series would present creative ways to kill the participants. The film doesn’t demonstrate a great deal of imagination, unfortunately, partially due to Steve Miner’s clumsy direction. He telegraphs every shot and scare as the film plods toward the inevitable. Although the score itself clearly ripped off Bernard Herrmann, the audio design integrated one innovative touch: the creepy “Ki ki ki, ma ma ma” elements that run through the film. These reverberated bits remain one of the series’ most distinctive elements and immediately make the movies identifiable. They work in an eerie manner that helps accentuate the action. Despite minor positives such as that plus a pre-fame performance from a young Kevin Bacon, Friday the 13th doesn’t stand as much of a movie anymore. Maybe it never was all that great, but it certainly influenced its genre strongly and helped create a new kind of horror flick. “Influential” doesn’t necessarily equal “good”, however, and the original Friday now feels like a museum piece. 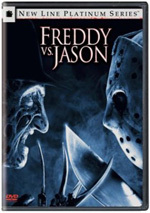 Friday the 13th appears in an aspect ratio of approximately 1.85:1 on this single-sided, double-layered DVD; the image has been enhanced for 16X9 televisions. With its serious low-budget origins, I expected little from the picture, but it turned out to offer a surprisingly strong visual presentation. Sharpness fared well across the board. Virtually no examples of sharpness marred the presentation. The flick consistently appeared distinctive and taut. Jagged edges and moiré effects created no concerns, and only a sliver of edge enhancement showed up during the movie. Mild amounts of print flaws cropped up through the film. Some specks and spots occasionally manifested themselves, but mostly within the tale’s first few minutes. A few showed up later, but most of the movie looked nicely clean. Colors presented a surprising strength. I figured they’d look drab and dated, but instead the hues came across as lively and bright. They showed good balance and consistently represented the material vividly. Black levels also seemed deep and rich. Shadows could appear a bit dense, but not badly so. Some of that stemmed from the situations; a lot of these quickly went from dark to light in the same shot, which meant that the image needed to balance both sides. This meant the movie occasionally looked a smidgen thick, but I didn’t find this to be a distraction, as the majority of the elements were well depicted and clear. I felt very happy with this transfer, as Friday looked better than one could hope. 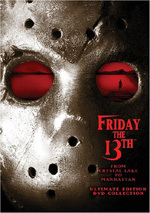 For this DVD, Friday the 13th featured its original monaural soundtrack. Unlike the picture, it didn’t surpass expectations, but it also didn’t disappoint. Speech sounded somewhat metallic but remained consistently intelligible and without roughness. The score occasionally mustered some reasonable depth but usually was fairly low-key. Still, it presented more than acceptable range and clarity given its origins. Effects also sounded lackluster but fine for something as old and cheap as Friday. Those elements lacked distortion and represented the source adequately. Don’t expect revelations from the audio and you’ll feel satisfied with this competent soundtrack. This version of Friday the 13th comes as part of a package entitled From Crystal Lake to Manhattan - Ultimate Edition DVD Collection. It gathers the first eight Friday flicks onto four discs and adds a fifth platter of supplements. Four of the flicks include commentaries that I’ll discuss when I get to those movies. Since Paramount designed the set as a connected package, I didn’t give the individual discs grades for supplements; I’ll reserve those for an overall review of the fifth DVD. Horror fans owe the original Friday the 13th a debt since it heavily influenced their favorite genre. As a movie, however, it doesn’t work particularly well. It lacks creativity and comes across as slow-paced and cheesy. The DVD presents surprisingly positive visuals along with perfectly acceptable audio. I don’t care much for the film in question, but I think Friday fans will feel pleased with the manner in which the DVD replicates the movie.